Team event with no choreography changes to JUMP JAM routines or costumes permitted. This is “Strictly JUMP JAM” for new or novice schools. Team Event with choreography changes to JUMP JAM routines and costumes permitted. Ideal for schools that wish to express their creativity. Pairs or Triples Event for student leaders. These students will lead/instruct an audience, using an original JUMP JAM routine. Individual Event for student leaders. 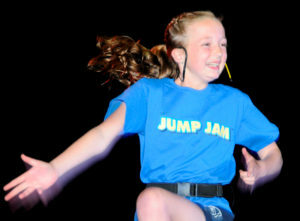 One student will lead/instruct an audience, using an original JUMP JAM routine. Photos for JUMP JAM Challenge and Idol from previous years are in the Gallery.